Enterprises in the 21st century are striving to be agile in order to take advantage of the transient market opportunities. Enterprises are engaging in business-to-business (B2B) commerce with business partners by entering into short-term as well as long-term business arrangements using various technologies such as electronic exchanges. In order for the enterprises to be successful in their business endeavors, a key requirement is that the underlying information technology (IT) infrastructure in enterprises be intelligent and flexible enough to adapt to various changes in the market opportunities quickly. In this chapter, we first examine the information technology (IT) infrastructure requirements for intelligent enterprises in supporting B2B commerce. We then review agents technology and propose an agents-based architecture to support B2B commerce. 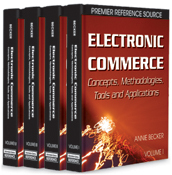 This architecture covers electronic exchanges and enterprise systems for B2B commerce. Finally, we present some workflows to show how B2B commerce can be conducted using the agents-based architecture.